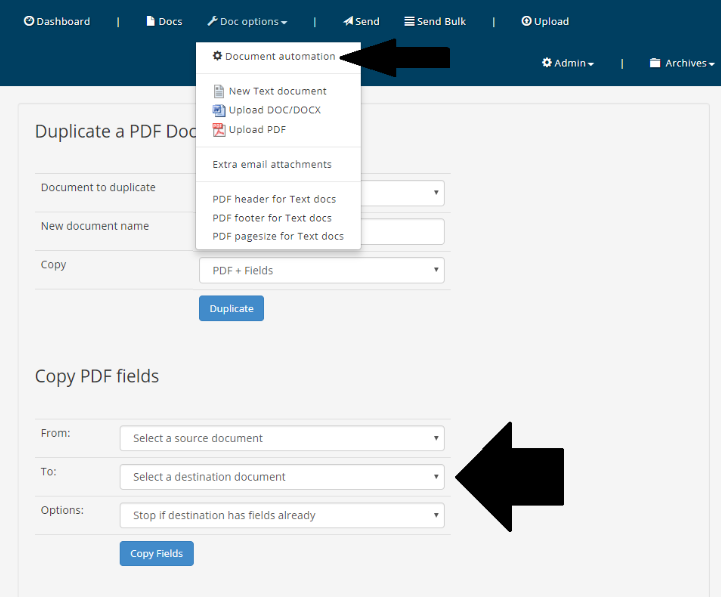 Use this feature to save time setting up fields where your new PDF is substantially the same as one you already have. It's very useful where you have to use similar PDFs for your esign documents each time, but sender fields won't do it. If you use substantially the same documents for esigning consider using sender fields - see this article on making PDFs re-usable on Legalesign with sender fields. Upload your new PDF that will get the copied fields. Make sure you give it a different name to the PDF with your existing fields. How to change PDF document name. On the dashboard, click on the Document icon - - and then 'Document Automation'. Scroll down to the ‘Copy PDF fields’ section and select the 'copy from' and 'copy to' documents from the dropdown list. Press 'copy fields' and Voila! Your fields will be copied.